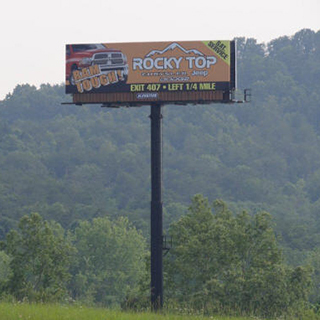 Description: This board is located on I-40 targeting west bound traffic prior to the 407 Exit to Sevierville/Pigeon Forge. It provides the advertiser the opportunity to reach the inbound traveler prior to Sevierville/Pigeon Forge/Gatlinburg and continuing Knoxville traveler prior to entering these markets. It has an exceptional read time and is ideally suited for an advertiser to reach both the tourist and the local comminuting traffic.